This week's soup is Mushroom and Cilantro Soup from Asian Soups by Suzy Smith. A thick creamy pureed soup of assorted mushrooms, cilantro and coconut milk, I was fully expecting to love this soup based on my fondness for the individual ingredients, but blended together for some reason it was just OK; fine but not great. I'm not sure what the issue was and the soup was by no means bad, it just wasn't a "WOW!" soup for me. When I evaluate a soup I make, I always ask myself if I would be happy if I ordered it in a restaurant and had to pay $7-$10 a bowl for it. This one just would not have made that cut. Heat 1 tablespoon oil in a large saucepan over medium-high heat. Add onion, garlic, ginger, cilantro roots and chili pepper and cook, stirring, until onion is soft, about 5 minutes. Add lime juice, stock, coconut milk and fish sauce and bring to a steady simmer. Simmer for 15 minutes. Meanwhile, heat remaining oil in a frying pan over medium heat. Add mushrooms and cook, stirring, until soft, about 5 minutes. Reserve some mushroom slices for garnish. Add remaining mushrooms and mushroom juice to soup. Add cilantro leaves. Working in small batches, process soup in a food processor until smooth, 1-2 minutes. Return soup to saucepan and reheat over medium-high heat, about 2 minutes. Serve immediately garnished with reserved mushrooms. Notes/Results: I made this pretty close to the stated recipe, the only differences being a bit more garlic and ginger. I used a combination of all the mushrooms asked for and "lite" coconut milk to cut the fat and calories. Instead of putting it in a blender, I used my immersion blender to puree the soup. There are too many soups out there for me to make an "OK" one again, but if you are a fan of cilantro and mushrooms and you want to give it a go, I would recommend more lime and chili to liven it up a bit. I did find that serving it with lime wedges helped the flavor some. And now, on to our round-up for Souper Sunday, now Souper (Soup, Salad and Sammies) Sunday. (See last week's round-up post for details if you missed the announcement). We have some new faces at Souper Sunday this week and it looks like we have some delicious soups and even a couple of sandwiches and salads to share--so let's get to it. 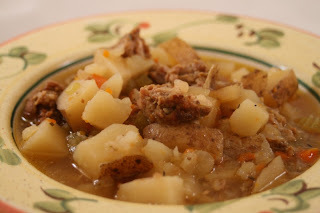 Kait from Pots and Plots was trying to use up the last of some freezer and pantry leftovers, so she threw some sausage, potatoes, and a bunch of other good things into her crock pot and came up with a delicious bowl of Tuscan Potato Soup. Although she thought the soup would be "decent", Kait was "amazed at how rich and flavorful it turned out", and she will definitely be making this soup again. 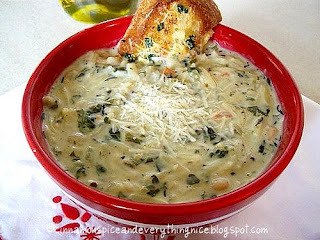 Also feeling Tuscany is Reeni from Cinnamon, Spice & Everything Nice, who took advantage of a cloudy, cold day to create a warming bowl of Creamy Tuscan Soup. Full of canellini beans, spinach and orzo, and herbs and with the required drizzle of olive oil on top. (Reeni has very strict rules about not omitting the olive oil--no soup for you!). She says this is a "luxurious and velvety soup". Since her best friend Kassi recently became a vegetarian, and she is trying to get more vegetables and healthier food into her own diet, Kim from Ordinary Recipes Made Gourmet came up with this Vegetarian Beet Soup. 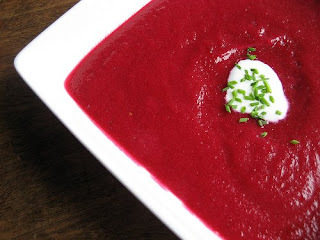 The bright color of the beets and the soup appeals to Kim's visual nature and she is on her way to acquiring a taste for beets, especially knowing all of the health benefits of these veggies. Making her first appearance at Souper Sundays is Cyndi at Cookin' with Cyndi, hailing from California. Cyndi used to host her own Thursday Soup or Stew Night on her blog, but then took a break from it and blogging. She is back and happy to have a place for her soups without having to do a round-up! 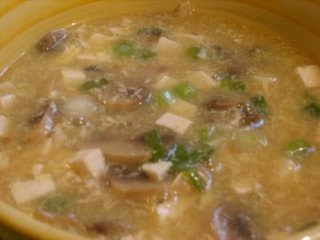 ;-) She made a healthy, "simple but delicious", Hot and Sour Soup adapted from Cooking Light. She says "it's not authentic but it's tasty!" Another new face is Kristin at Whatcha Eatin'?, who joins us from New Brunswick, Canada. Kristin spent a few days reading her favorite blogs and trying the recipes that caught her eye, including two soups. 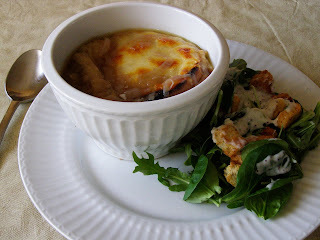 The first, Donna's French Onion Soup, (from Donna at My Tasty Treasures). Kristin says it does take some time to make this soup, to get all the flavor out of those onions, but it is worth it! 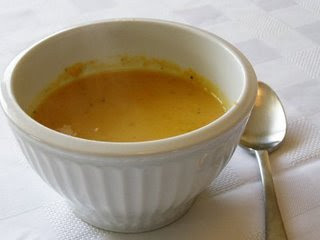 Her second soup was Katy's Flemish Carrot Soup (from Katy at Food for a Hungry Soul). Kristin loved the taste and plans to take this thick, chowder-like soup for lunches this week and also has some plans for interesting adaptations. Welcome Kristin! We also have Coleen from Coleen's Recipes and located in Southcentral Alaska, in the Souper Sunday kitchen for the first time this week. Coleen loves having a crock pot of soup on and ready to go on a busy weekend and has a special spot in her heart for her childhood favorite bean soup. She has tweaked and perfected her Crock Pot Bean Soup recipe over the years and found that adding beef broth really enhances the flavor. Good to have you Coleen! Ulrike at Küchenlatein says that Germans love their white asparagus or "spargel" and since it is spargel season there right now, she took the opportunity to make this hearty, lemony (White) Asparagus Cream Soup. 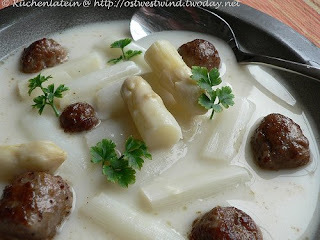 Ulrike says her sons both loved the little meatballs she put in the soup more than the asparagus! (It does seem like a great way to get them to eat their vegetables). Heather at girlichef is brilliant! 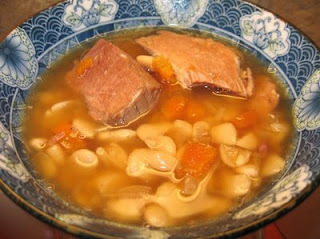 She used her Foodbuzz trial package of Buitoni Riserva pasta to make soup! (Why didn't I think of that?) 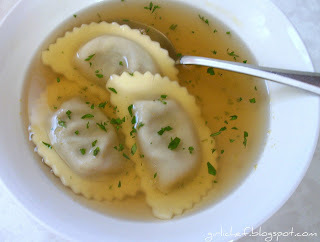 She found that her Garlic, Mushroom and Herb broth w/ Wild Mushroom Agnolotti was easy and delicious and not too heavy. Not only did she and her daughter enjoy the pasta in the savory broth, she liked it enough to eat the rest of the agnolotti right out of the strainer! Since we opened up Souper Sunday to include salads and sandwiches or "sammies", we were able to coax Joanne from Eats Well With Others to join us. (Joanne is not a soup lover but we won't hold it against her!). At school in Cambridge, MA, Joanne makes some of the yummiest sandwiches I have seen and this week is no exception with her Avocado and Barbecue Sauce Sandwich. 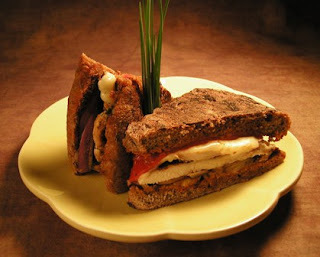 A major runner, Joanne needs to keep her self well-fueled with healthy food and this sandwich fits the bill perfectly! Practicing "guilt-free living" at it's best is Natashya from Living in the Kitchen with Puppies. She branched out from her usual soups this week to make both a salad and a sandwich for a light, healthy meal. 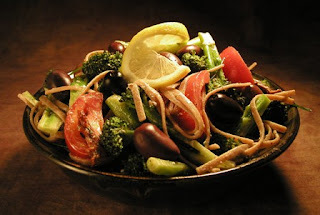 Her Mediterranean Broccoli and Whole Grain Noodle Salad is chock full of healthy veggies and whole-grain noodles. Some leftover chicken was perfect in her gorgeous Grilled Chicken Panini, with pesto, roasted red peppers, mozzarella and on some hearty, whole-grain focaccia. Natashya says they both are "so good you will forget how healthy" they really are! A great turnout this week and it is fun to see not only the wonderful soups but some terrific sandwiches and salads too. Welcome to our new faces and mahalo to everyone who participated. Have a great week! Don't forget you have until Wednesday to enter to win 5 Spices, 50 Dishes in my three-part "300th Post / 1-year Blogoversary Giveaway". You can get the details here. A great turn out! Everything looks so delicious! Thanks for letting me join in! I look forward to more Souper Sundays in the future! I'm sorry you weren't happy with your soup. On paper it looks like it would be really flavorful. But it does look delicious-your presentation is great, as always. And what a wonderful round-up!! AWESOME roundup.. I wish Ihad realized it was salads alos, I would have put my current post in.. always next week, right? Loved reading all these, nicely done as always. sorry your soup wasn't a "wow" soup. your round-up was still great! What a great round-up! For whatever reason, I'm not fond of mushrooms paired with coconut milk. I think the two flavors war for dominance when combined. That's too bad that your soup wasn't as good as you had hoped. It sounds like it would be fantastic, all the right ingridients! Well, the mushrooms & cilantro sounded good in print :/ and it looks pretty! Great soups, sammies & salad this week...everyone did such a great job! It's too bad about your soup, but we can't win 'em all (or, well the cookbook publishers can't). One would THINK that the mushroom/cilantro combination would be earth-shattering. I like the way you evaluate your soups, that's basically how I decide which of my creations to make for my family when I go home!